Access to the beach the Puntalejo (150 m) is asphalt and the final section (30m) is a path wide land without difficulty. Calla Lily Puntalejo is seen in the photos. 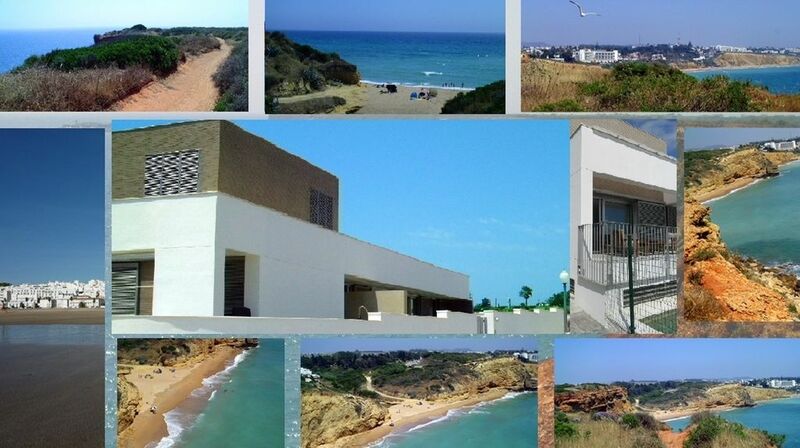 It is a lovely beach for its proximity (150 m), its seclusion and its views from the surrounding cliffs. In the cove some spectacular sunsets are seen, and when it is low tide you can search for all kinds of mollusks and others. You can also access to other beaches from it if the tide is low. Fuente del Gallo, El Roqueo, La Fontanilla and Conil, El Palmar, Barbate, etc ..: from the Cala left the following beaches are uninterruptedly Right without communication shore because of the cliffs, it is the Oil Creek, the marina and the lighthouse, Las Calas de Roche, etc. The beach is just below the Cala El Puntalejo, as I said before, it Fuente del Gallo (400 m, a minute's drive) which has a wide parking area. It also has both ramps and stairs for access, with poolside snack bar, red cross, etc. It is a beach with gentle slope (important for children), small waves and fine sand (no stones). The house has 5 bedrooms, 4 bathrooms (one inside each bedroom less than the games room) and a toilet. It has a total of 18 beds and two cots. Ground floor of 180 m2: Hall, lounge, kitchen, bathroom, hall with fitted wardrobes and three bedrooms (2 with three beds and bed has 4 places), with a bathroom per room, which is accessed from the inside the room itself. There are two bedrooms with 2 trundle beds of 90cm and 90cm 1 hinged bed and the other has 1 double bed of 150cm and 80cm 2 trundle beds. All bedrooms and living room have windows that allow direct access to the garden and two porches, both front and side rooms overlooking the pool from the lounge. The living room has a sofa bed 180x120 and a sofa bed 180x80. All bedrooms have their own TV. top floor of 30 m2 plus terrace of 100 m2: access by stairs. It has a fairly large and overlooking the ground floor and living hall. Quadruple room consists of two beds of 90cm that can be converted into bunk beds. Own bathroom with access from inside the room. This plant has a solarium 100 meters. 50 m2 basement: games room with foosball, billiards, air hockey, ping-pong table, study tables and board games (cards, ludo, chess, dominoes, trivial, monopoli ...). It also has a refrigerator with freezer, and 4 beds (2 sofa bed 180x120 and two folding beds 80cm). In this room there is a small double room. 300 m2 Garden: The garden surrounds the house and consists of natural grass surface and decorative flowerbeds. Porch on the side of the lounge is the pool of 20 m3, which is protected by a fence to restrict access to minors. In this part of the walled garden it is also the barbecue. The entire exterior of the house, including the pool, has a magnificent lighting also enjoy the evening. Un finde en familia genial. Una casa totalmente recomendable, todo lo que se nos dijo estaba. Somos una familia grande con niños de todas las edades, y tanto adolescentes como pequeños disfrutaron de la casa, los juegos de que se dispone en el sótano y de la cala que esta cerquísima de la casa. Las camas totalmente cómodas, con colchones en buenas condiciones. Excelente estancia, chalet muy bien equipado, muy completo, amplio, cómodo en zona tranquila, junto a la playa. Hemos disfrutado muchísimo las 11 personas que hemos estado en la casa, tanto los peques como los no tan peques. Nos han atendido de lujo y era todo tal cual lo anuncian. Muchas gracias, seguro que repetiremos. Para grupos de adultos sin niños la fianza será de 500 € mínimo. Las tarifas para este tipo de grupos tienen un incremento cuando superan las 12 personas. Si el grupo de adultos es de menos de 25 años, la fianza será de 1.000 €. La fianza se abona y se devuelve por transferencia. La devolución de la reserva sólo será posible en caso de anulación si la propiedad se vuelve a alquilar.